Real human bodies have been in demand as learning tools since anatomy became integral to medical training in the 19th century, says Dr. Charles Graham, head of the Department of Anatomy and Cell Biology. “Students need to touch and see the human body in three dimensions. There’s only so much you can learn from a textbook.” Or from models, real or electronic. 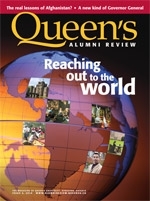 Fortunately for Queen’s, 20-30 generous donors (most of whom are older people) bequeath their bodies each year, ensuring a steady supply of cadavers and tissues that benefit not only research, but also the education of anatomy, life sciences, medical, nursing, and rehabilitation therapy students. On any given school day, you can find students in white lab coats in the Anatomy Department examining knee joints, or perhaps studying jars of lungs or femurs in the Anatomy Learning Centre. Next door, in the morgue, is where bodies are embalmed, and there’s also a dissecting room where bodies or body parts are prepared for use – sometimes plastinated, for example, so they can be handled repeatedly without damage. In the past, anatomy departments faced a shortage of donated bodies – which meant that many that found their way into medical schools were unclaimed cadavers of destitute people, or bodies stolen from graveyards. The Toronto Globe even reported in 1882 – when body-snatching was rampant in Britain, and not unknown in southern Ontario – that Queen’s medical students had opened a grave and stolen the corpse of a young man who had died at Kingston General Hospital. The rising cost of undertakers’ services likely is one reason for more body donations across Canada of late, but genuine interest in medical education in general and Queen’s students in particular is clearly a motivation. These days, however, people actually will their bodies to Queen’s. Kingston lawyer Katherine “Cookie” Cartwright, Arts’62, Law’65, plans to do just that. A donation is a familiar idea, but giving your whole body? Cartwright explains she has no qualms about doing so. “What good is my body to me when I’m dead? The students may as well learn from it,” she says. The rising cost of undertakers’ services likely is one reason for more body donations across Canada of late, but genuine interest in medical education in general and Queen’s students in particular is clearly a motivation. The University covers the cost of cremation and funeral arrangements for donor remains. Each year, families, friends, and medical students are invited to a ceremony to honour those who have bequeathed their bodies, and the ashes are buried in a suitably marked University-owned plot at Kingston’s Cataraqui Cemetery. now working on her MSc degree. “I’m very grateful for this resource in my learning,” she says. For more information about the Human Body Donor Program, please contact Anita Lister, Queen’s Department of Anatomy and Cell Biology, at: anita.lister@queensu.ca; 613-533-2600.